Forum Index > Makers and Manufacturers Talk > Asking for input on production axes for this season. Posted: Tue 24 Aug, 2010 7:50 pm Post subject: Asking for input on production axes for this season. We are gearing up to start making a lot more pole arm weapons this season. We have always made hundreds of axe and pole arm patterns. It doesn’t take me long from design to finished piece and I would like to give you all the chance to post pictures of historical axes that you would like to see produced. I don’t need any help with the fantasy axes, I got that covered. We most likely already have the pattern or a similar pattern for your favorite axe but maybe we don’t and now is the time that you can have some input on a production run of your favorite shapes. We already make enough war hammer designs and maces. Even some combo axes with hammers on the back. Let's stick to axes for now and then pole arms later. We tend to stick to about a dozen or 2 axe heads a season with some custom pieces along the way. I think it has a nice shape overall but I think that the socket would look better and more historical with a rectangular and not round shape. I second this idea, as archeological findings also look to be flat around the haft-socket area. I don't know how it was done (grinding around a drifted socket or what), but the modern rounded or wrapped weld around a socket does not compare well to excavated finds. 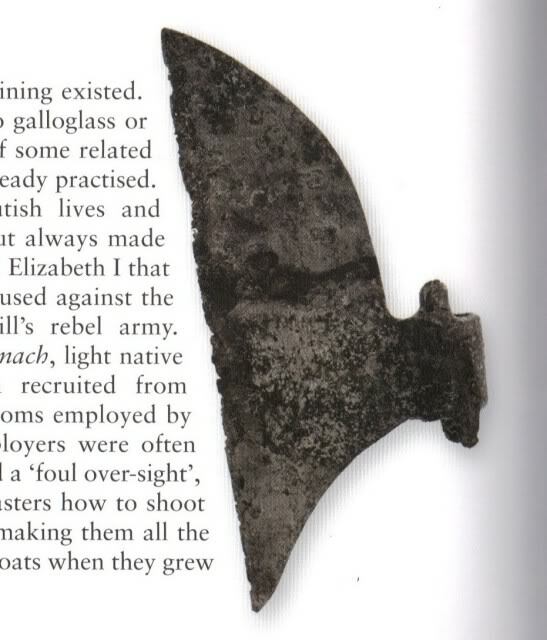 The way the example axe was shown is how we do most of our production axe heads. We often do a flat sided version of the socket, but as pictured is our standard. That particular design isn't based on any historical piece. Our good friend and fellow artist John Adams(He owns http://rampantliondesigns.com/ which we make the shields for) drew that up about 12 years ago and it has been a steady seller. If a certain pattern calls for flatter sides then we will do that on some. Thanks for the suggestion. I had a neat suggestion pmed to me. Might have to give this a try. We have a pattern a lot like this. Its a bit more square on the top though, so this would call for a new pattern. I also like the langets on the socket. I tend to carve the pole so the langets are fitted in but seen here it is just sitting on top of the wood because the haft has a flat all the way up the sides. I'm not sure what route I will go with that, but I will do the langets. Let me say again that I am looking for some patterns to add to our standard line. Our fully forged line will hopefully be in full swing as soon as we get the Nazel 4b set up with the proper dies. I cant wait for that, however they won't be as afforable as our standard axes. 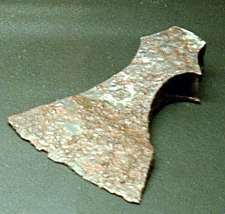 How about doing an axe head similar to the one from Sutton Hoo? The original had an iron haft, however I think doing it as just a head would work nicely. Then the purchaser could then install whatever length haft they wanted. It's a style not often seen in reproduction pieces unfortunately. That's fairly simple. I think we were planning on doing one with a steel haft. I dont see we couldnt do one to be mounted on wood. I will get back to you on that. I know that myself, as well as other forumites, are partial to Viking patterns. As am I. We could do this pattern. It would cost a bit more then the standard axes. The socket would take a bit longer but 100% doable. Maybe I will work up 2 patterns for this. One done our standard way and one with this socket set up. That way if a stage guy is looking for something with the correct head shape but wants it cheap he can go the standard route. I am almost done the gallowglass axe. Made it a bit thicker then the example I first posted so that I could bevel the edge more. I will share that soon. Here it is. Oue new Gallowglass axe. How's about making a boarding axe (as below). I am right there with you. I do a lot of Golden Age of Pyracy and early american re-enacting. I have quite a few boarding axe patterns. The langets on this are on the front and back not the sides and the langets are not attached to the head. They are attached to the pole and the head is slipped over them. Neat. Oh yes, I really want one like this please! Here is a pole axe head with a hammer back that we did last week. I didnt have time to post it then. This pole axe was inspired by a few originals. I dont have the pictures on hand. I will dig them up. We have made this pattern for about 6 years now. Sometimes we do it with a top spike and some just like this. Some get mounted on long poles and others on shorter ones. 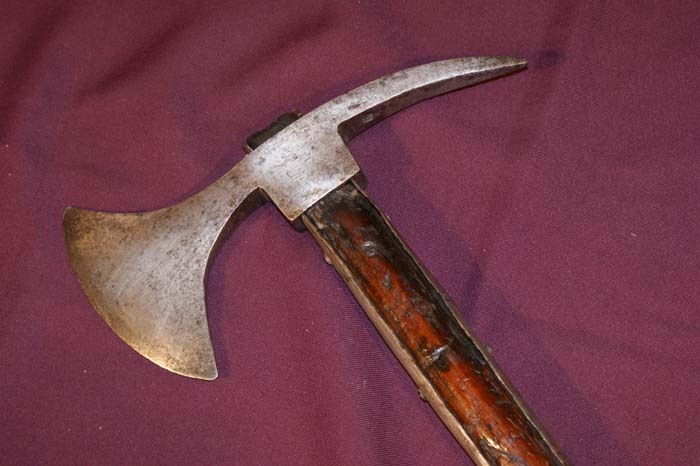 I believe axes like this were used in many different ways. I do have a request for an axe or two. Also, I thought you had a spot on your website just for axes somewhere on your website, including a bunch of axes and fantasy axes you had made in the past? Can't seem to find the link to those pictures that I remember. 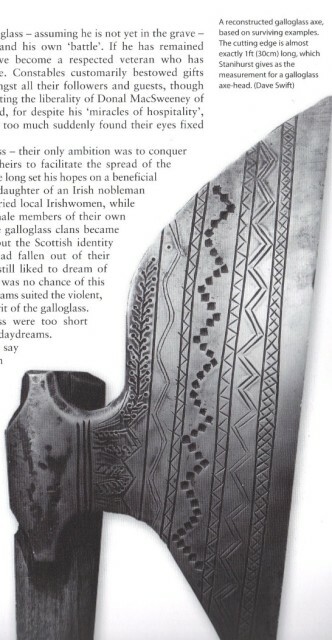 I'd like to see pictures of all the historical as well as fantasy axes you made in the past, that would be great. Do you have pics of halberds, Gleves, and pole weapons you have made in the past as well? is there a cost-effective way to produce the design elements shown below without having to do casting? I suppose you could etch them but that probably wouldn't look right. Any other ways? It's pretty cool stuff. All those are beautiful, and look well made. would finish the axe perfectly. 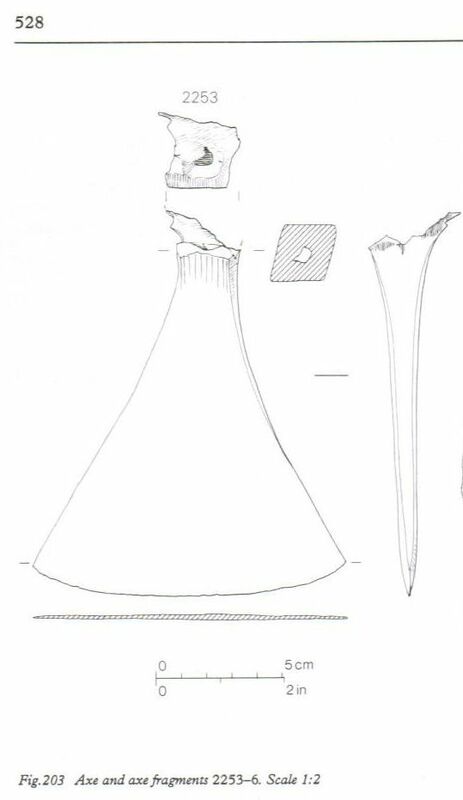 Is the pole axe head going to be hafted with a spike on top or is the axe head on a haft by itself? Keep up your amazing work and well done. I would definitely avoid any kind of etching. It would likely just end up looking really off. It's going to cost money to make a nice axe- just like it cost to make a nice sword- at least a historically accurate one. Well we are working on a version of that axe now with that look to it. If you look close it was made with chisels. Nothing hard just takes time. A cheap way to produce it ...not so much but we will produce it anyway. It will most likely add $100 to the cost but it will look just as pictured. I will let you know more as we work through it, but today we are getting most of the big beams in place for our shop addition so I will let you know in a few days. There are some modern engraving tools that we own and we will give those a try too to see if we can pick up some speed without sacrificing the look. Socket would traditionally have been folded over, so semi-ovoid. a 'blunt' with 3mm edges (perhaps built up) and rounded corners would be fabulous but that may not be your cup of tea. 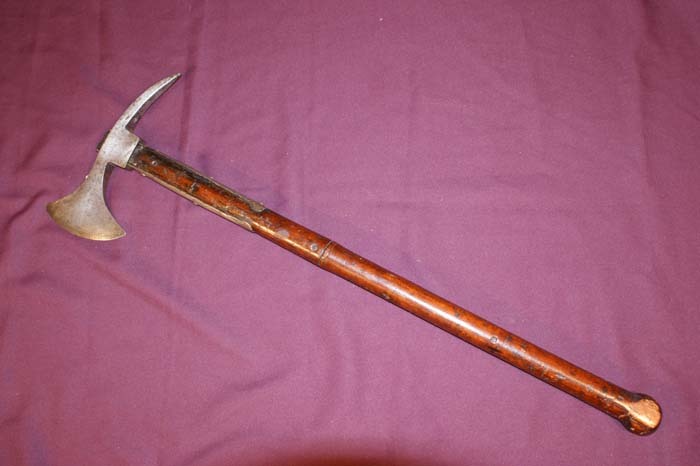 Very nice looking hammer and axe combination or poleaxe I guess. Nice as it is but I could see a variant where the top horn of the axe could extend longer giving a thrust capability even without a top spike.